In the olden days, you had the choice between a noisy alarm clock or just opening your eyes a little to watch your wristwatch. Then your wristwatch got a countdown timer. And then your cell phone got one too. Now you have the choice between a number of advanced apps for your iPhone, and I’m sure for many other smartphones. I’m using “Insight Timer”. It used to be called “Zen Timer”, but probably appears less sectarian with its new name. You can choose between a free and a paid version, but even the paid version costs so little that I don’t remember which of them I have. Its most basic function is the same as that of any countdown timer: You decide when the bell should ring, and it does. But there is more. In contrast to your wristwatch version, it can produce any number of different sounds. The standard ones sound very Buddhist, though quite nice even if that’s not your religious or meditative preference. You can also choose to start with one sound introducing your meditation period, and to have any number of different interval sounds, if your practice requires changes as you go along. You may even make your iPhone display different labels at various times during the session. You can make presets, which is very practical. Mine are quite simple: “Half hour”, “Three quarters”, “One hour” etc. But you can also have presets for, say, 30 minutes of meditation and 5 minutes of rest before and/or after. Once you have set that, you don’t need to do it anew every time. If you wish, you can also use it to keep a log. I don’t usually do that, but now when I look it up, I can see how much I meditated on every day since I started using it – or every day since I last deleted the log, or at least every day that I used this timer to measure my meditation time. I know some people find this to be of help in establishing or keeping regular meditation habits. You can also write your own password-protected meditation journal, though I’ve never done that. You can choose to call your activity “Meditation”, “Yoga”, “Exercise”, “Reiki” or nothing at all, though as far as I can tell, you can’t have one preset for meditation, another for yoga etc., which is a weakness for those of us who practise both. You can also not create your own category. Assuming that you know what you are doing, these labels are unimportant, except if you link up to Insight Connect, where you can (if you wish) tell the whole world that you are meditating (or doing yoga, or whatever). You will also be able to see who else is meditating, or has recently been meditating, including how long they meditate and how many minutes are left of their meditation period. Not important, but quite cute. I regularly look into the meditation habits of a few of my friends! You can, if you wish, also link this feature to your Facebook page, and only yesterday somebody who had apparently “seen” me meditating this way asked to be my “friend”. You can also add a greeting to those who see you’re meditating. I chose to simply add the label “Acem Meditation”, since I would like more people to know about this method. For those of us who do round-the-clock meditations from time to time, it’s a pity that this timer can’t include meditation periods of more than 23 hours and 59 minutes. That’s just not enough for those of us who have up to 50 hours of meditation at 3-week retreats every winter. But I guess we are an exception. Nice app i wasn’t knowing about it. But I prefer to use the concept of self triggers in daily routine. I enjoy reading the ways you suggest to alert youself tothe end of meditation time. When I know my morning or evening meditation has to be limited to a certain amount of time I still use an old cooking timer I muffel behind a pillow. Reading this article is like someone saying to me hello and welcome to the twenty first century. Yes, welcome, Roberta – and everybody else! I’m sure there are other good variants than the one I have used, but it works very well – and for more than just keeping the time. In the 21st century! I have been looking for this sound many, many years! I have always wanted to have a bell indicating the end of my meditation. 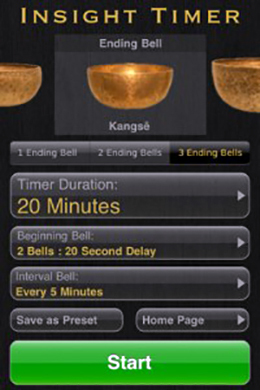 The Kangse Bell-alternative with its long sounding bell is for me just a beautiful way to end a meditation. I really enjoy it. I have used a count down on my wrist watch, but that mechanical sound is just nothing to this real thing! Thank you, Halvor! The Insight Timer is excellent! I had an iPhone earlier, which I enjoyed, but now I have an Android phone, Google’s Operative system. It gives the user some more flexibility. I’ve now programmed my phone to enter silent mode automatically when Insight Timer is in use. No more interrupting phone calls during meditation sessions! Phone salesmen? Don’t get me started!. 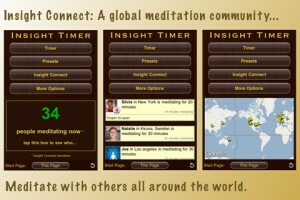 For Android users, Enlighten App has just been released which features a meditation timer. It is a first release and at the beta testing stage but hopefully still usable and useful. Please feel free to test it out and pass it around. Any feedback to help improve and shape future versions would be greatly appreciated.